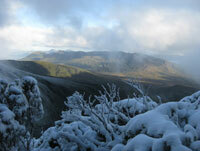 The Western Arthurs are not the first choice for a bushwalk in June. 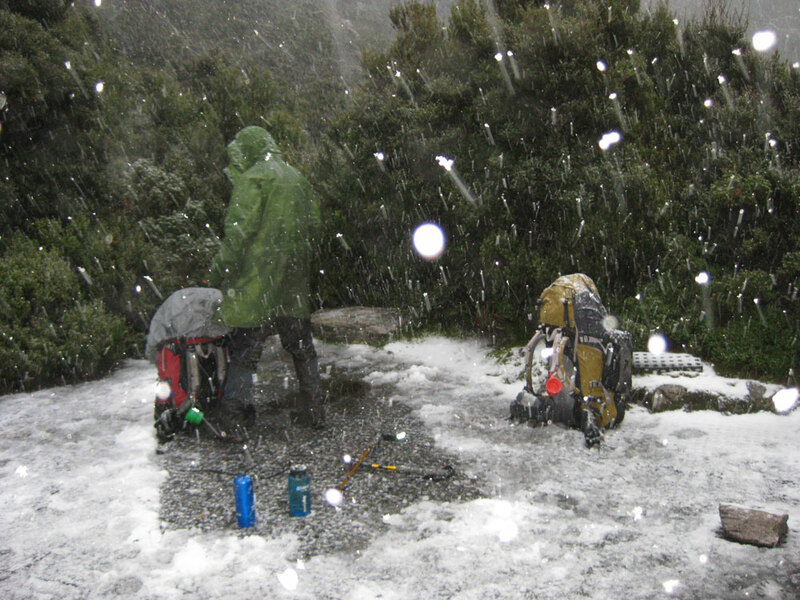 The short days and frequent snowstorms see almost all walkers opting (perhaps sensibly) for the Larapinta Trail, North Queensland or the doona cover. Not everyone is sensible though. 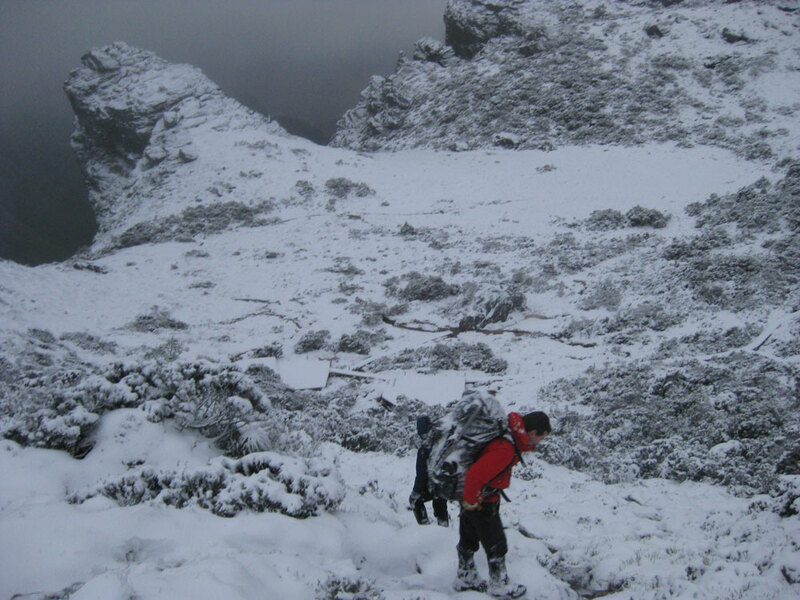 Curious to see just how bad it could be, Andrew Peters, Bogong staffers Jack Chenoweth and David Blundy, and Wilderness Shop staffer Tim Blundy, packed their woollies, headed south and attempted a winter traverse of the Western Arthurs in June 2012. 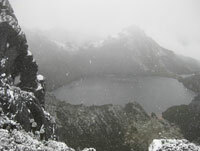 ‘The Western Arthur Range is subject to some of the worst weather in Tasmania,’ warned the guidebook. ‘Violent storms and snowfall occur every summer’. 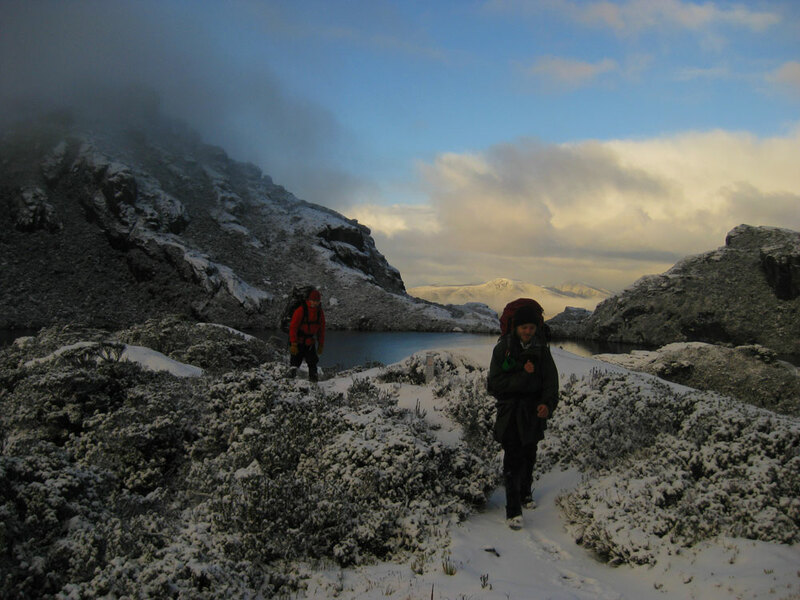 ‘That’s lucky’ we thought – we were going in winter. 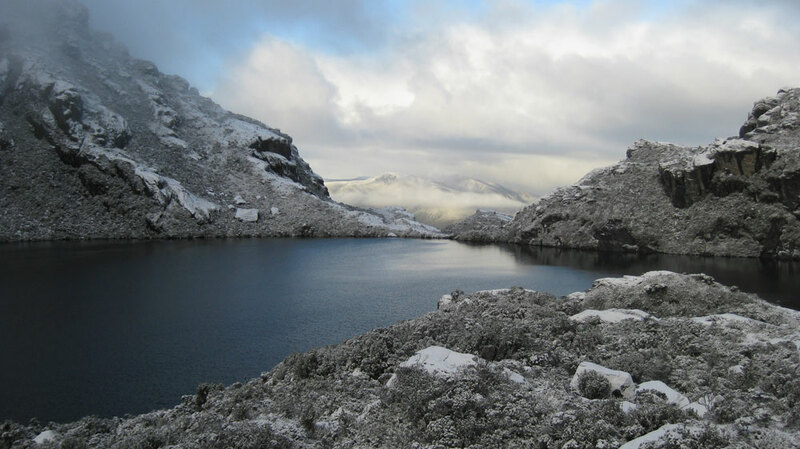 It was a balmy 5 degrees and sunny as we set off from Scotts Peak Dam with 10 days food, two 4 season tents, crampons, ice axes and a lot of warm kit. The Arthur Plains were occasionally in sunshine and the track reliably boggy, leaving only the cold overnight temperatures to indicate that this was not a regular summer jaunt. The early part of the climb up Moraine A was in watery sunshine that saw us strip down to just one thermal layer for the first (and last) time on the trip. 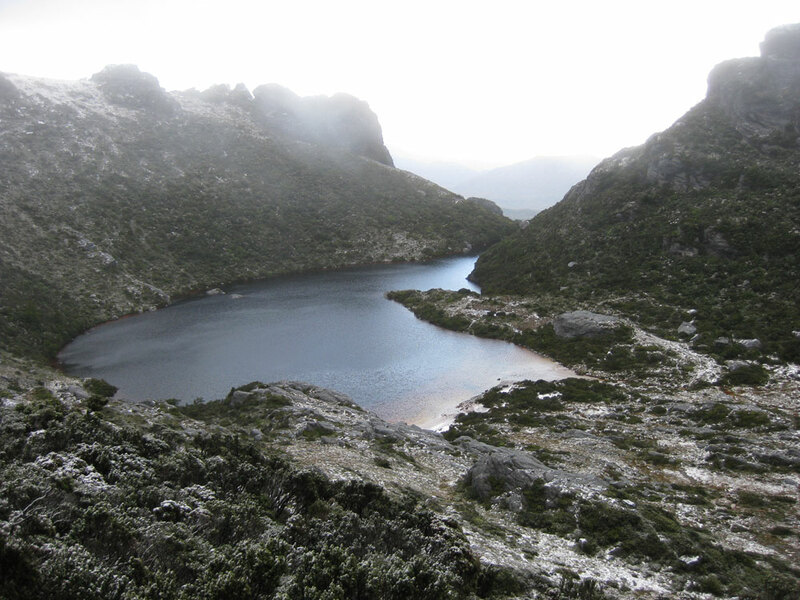 The only really awkward part was the snow and ice covered descent into Lake Oberon. 3 nights in and everything was pretty dry, we were well fed and had even managed to play a game of 500. Maybe this whole winter thing was a bit overrated? We had always presumed that it would be fairly straightforward to get to Lake Oberon. The business end of the trip was going to be the higher, more intricate and exposed section through to High Moor and Haven Lake. The next morning was one of the most beautiful of the trip: blue sky, light winds, views over the plains and 10 cm of fresh snow glistening in the sunshine. Surely it was just the day to quickly nip over the Pegasus and be at High Moor in time for afternoon tea? The problem though was the time. 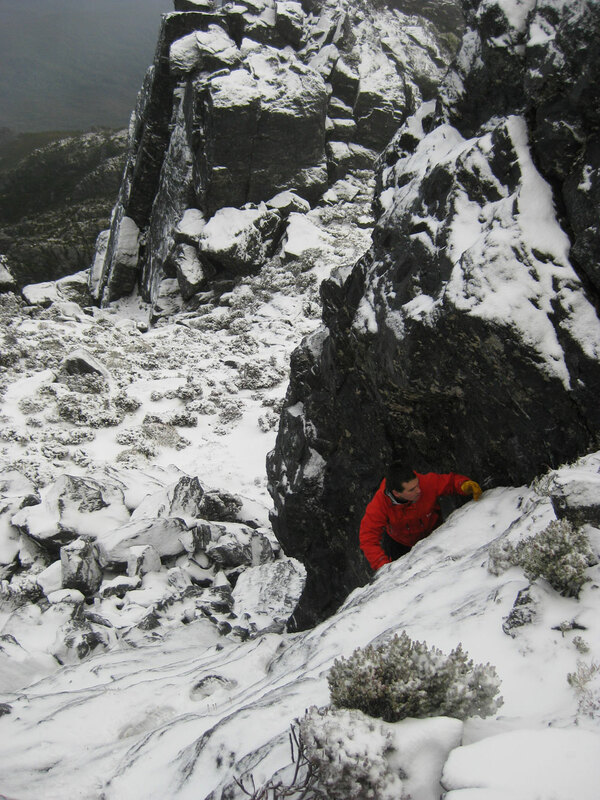 We had seven hours of daylight in winter and it had taken us one hour to negotiate four metres. This, as the expedition mathematician would confirm, extrapolated into some very ugly numbers. We decided to re-evaluate at the top of the Pegasus. 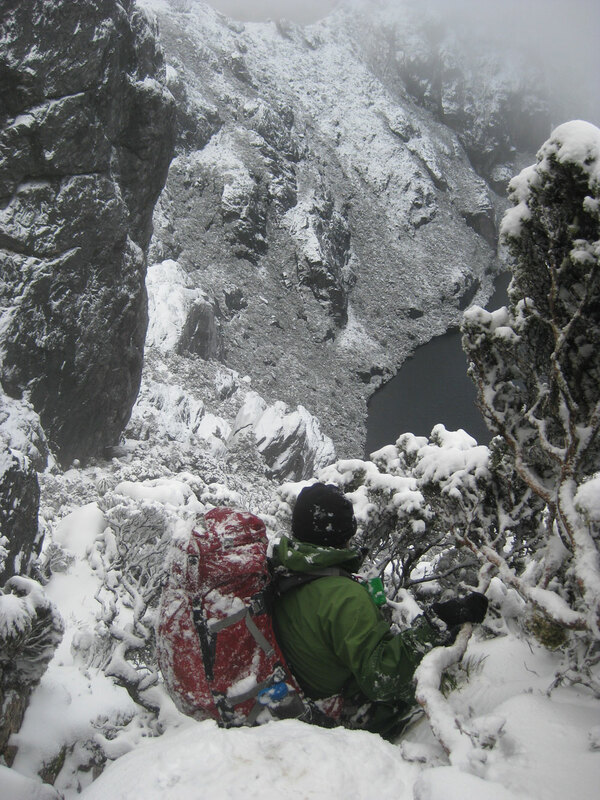 Four hours later we topped out and decided to press on, largely due to the comforting comment in the guidebook that ‘times vary widely between groups’. Although the rest of the day was predictably steep, the considerable desire not to camp on an exposed saddle meant we hit the duckboards guiding us into High Moor just before dark. We woke to 40 cm of fresh snow and strong winds that suggested a long day out through the Beggary Bumps. Progress was slow through the knee-deep snow and navigation was difficult as the snow obscured both the track and any cairns. 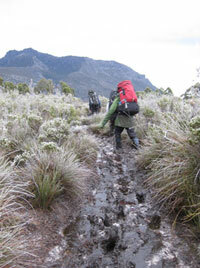 An unintended excursion down a gully did little to help matters. This was the ‘I hear the Larapinta Trail is pretty nice at this time of year’ moment. Although our diversion was literally about 50 metres, it had taken an hour out of the day and we were sopping wet and covered in frozen mud. We only had one option: to keep going. We managed to get through the most technical part of the track in the light and we arrived at Haven Lake about an hour after dark. Haven Lake was a decision point for us. Should we continue on to Prom Lake and do the full traverse or should we just hightail it down Moraine K and call it quits? The decisive factor was how wet everything was. 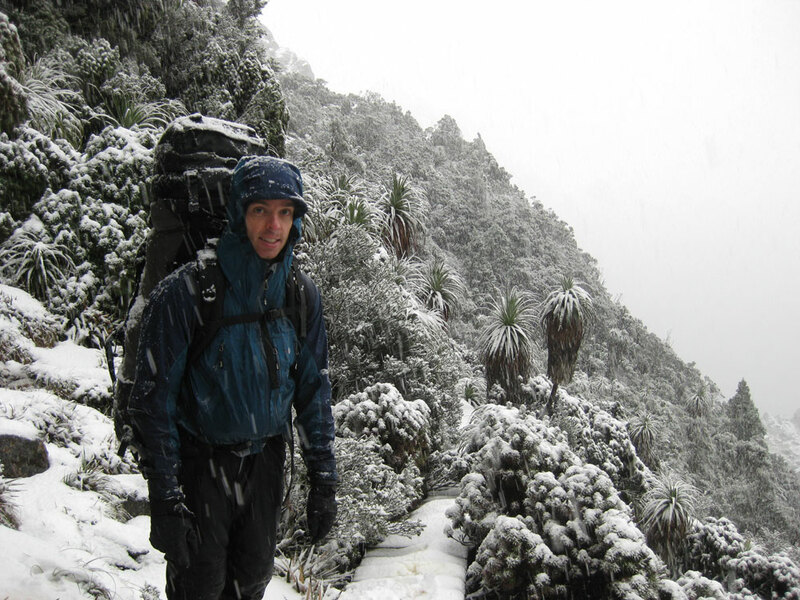 After 6 nights on the range, our sleeping bags, clothes and down jackets were all significantly damp. 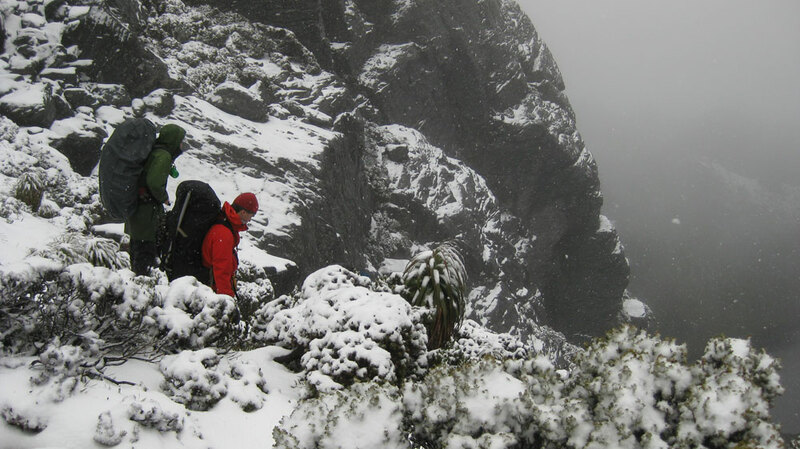 While the rest of the route was not as arduous, we decided that our fun was over and it was time to call it quits. 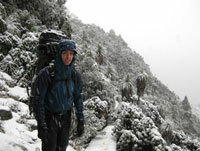 The next morning we set off in ordinary weather and deep snow. The route was ambiguous but the plan was simple: camp at Seven Mile Creek, wake up, walk up the valley and be drinking beer in New Norfolk by 6pm. I woke up around 3 am as my mat felt a bit strange. My mat was floating! Despite a relatively dry night on the plains, there had been a storm on the range and Seven Mile Creek had broken its banks. Our campsite was flooding. We were instantly awake. The creek was rising quickly and with a considerable current. 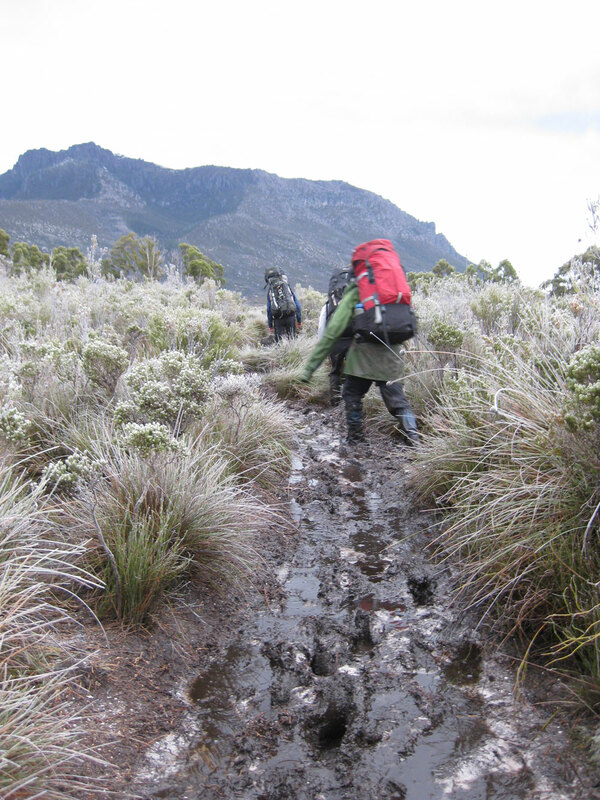 Gear in vestibules was grabbed indiscriminately and put on high ground while water flooded into the tents transforming our sleeping bags from ‘damp’ to ‘sopping’. This was the ‘why on earth didn’t we do the Larapinta Trail instead?’ moment. It was 4 am, very cold, our campsite was 3 feet under water and our gear was soaking wet. There was only one course of action: we had to get out now. Our critical problem was that there were three flooded creeks that we needed to cross to get out to the car and we were in no condition to stay in another night. We reached the first bit of high water at 6 am and decided that crossing a flooded creek in the dark was not the smartest move, so we put up the one tent still working to give us some shelter. We sat there for a few hours hoping the rivers would drop and thought about how comfortable life could be if we weren’t into things like this (for the record, it is possible to have 4 guys lie down in a Mont Epoch as long as you are very good friends). 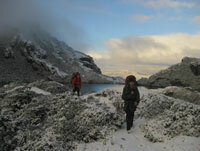 When we set off, the weather was a delightful combination of frequent snow showers followed by moments of sun. 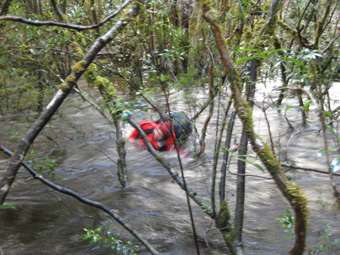 Five Mile Creek was our first obstacle, which was about chest deep but running fairly slowly. This was crossed reasonably easily by everyone with the exception of Andrew, who thought that this would be a great opportunity for a dip and went in up to his neck. Two Mile Creek was a different matter. It was very deep and wide and running quickly. It was crossed with the aid of some naivety, audacity, a log and a rope and eventually all four of us were on the other side. The icy water at each crossing sucked the last of any heat from our bodies and we were having serious problems in regaining temperature after each one. To our relief, Junction Creek was relatively low so we managed to get back to the car without further incident. Some 14 hours after leaving Seven Mile Creek, the trip was over. It was more challenging than we expected but the rewards were considerable. 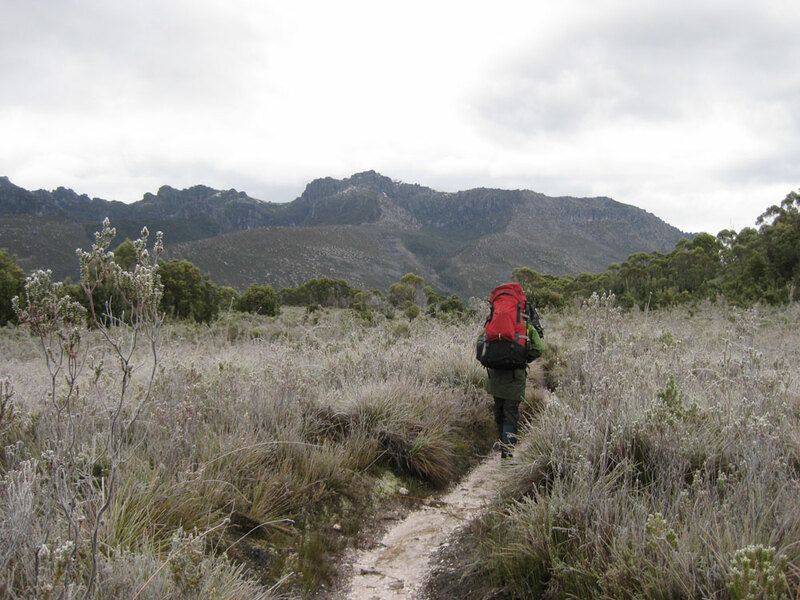 Winter bushwalking in Tasmania is tough but feasible as long as everyone is experienced, has good quality kit and doesn’t mind being uncomfortable at times. 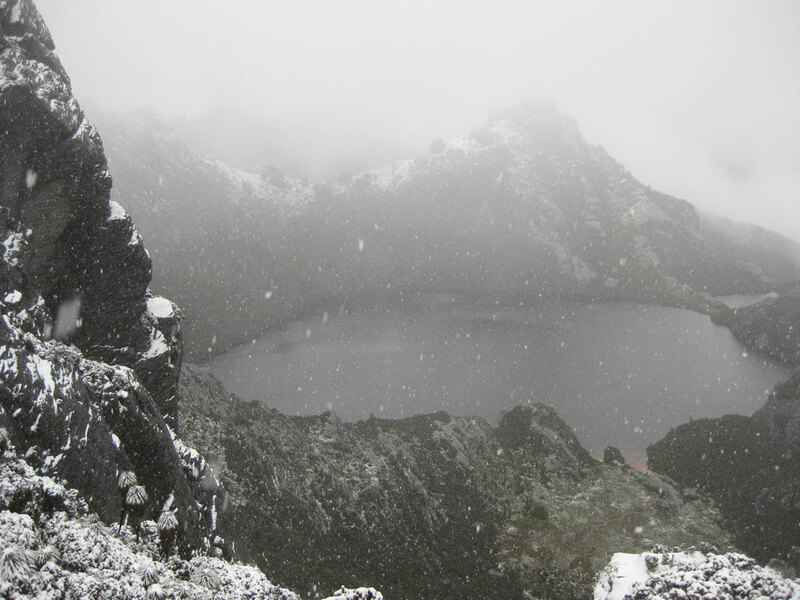 The memories of fresh snow glistening in the sunlight and steep gullies filled with waist-deep soft powder will last as long as memories of stuffing wet gear into bags at 4am and swimming flooded creeks. If it intrigues you, find some people who don’t get easily frustrated, make sure your gear is in good order and go and give it a crack! We took a Mont Epoch and an Exped Venus II. Both tents stood up to all the weather without any issue, were very liveable and shed snow really well. 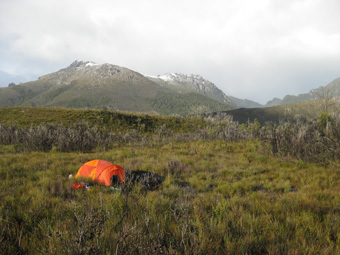 If considering a tent, the main criterion is to go with something that is a full specification four-season tent. You don’t want to be mucking around with substandard gear in those conditions. This was probably the major defect in our kit. In hindsight, a four-season bag with a waterproof shell such as a Mont Telemark Hydronaute XT would be the best option. 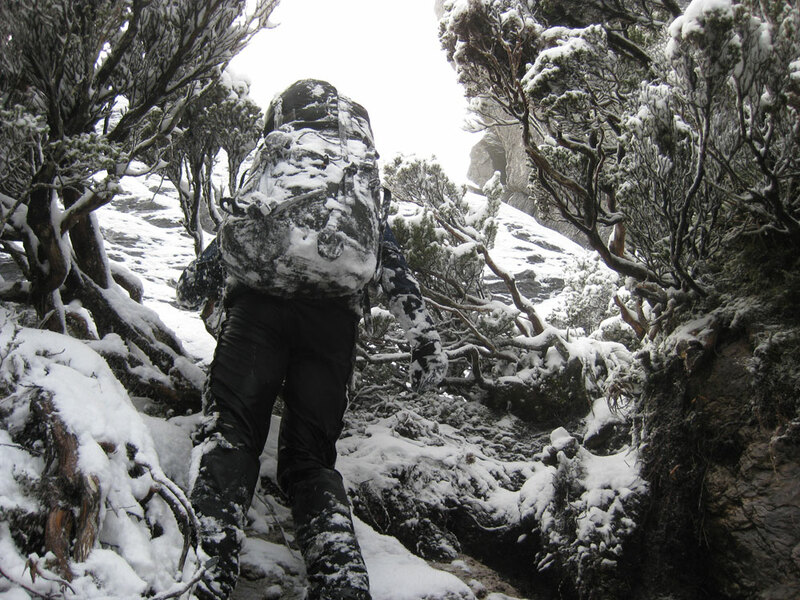 While warm, our bags ended up absorbing quite a bit of moisture both from the environment and from condensation. In general we found that we were colder than we expected so if in doubt, go for the warmer option and seriously consider a Hydonaute XT or similar shell. 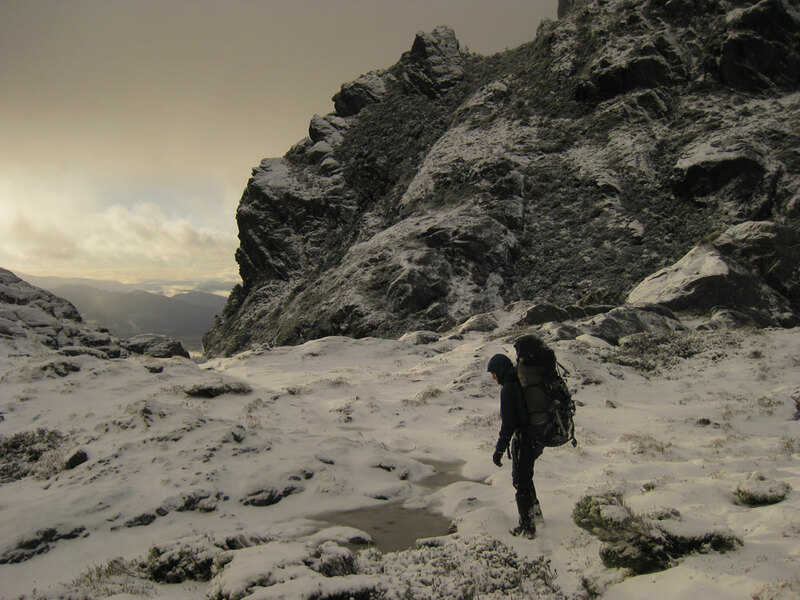 When we were walking, we wore a woollen or synthetic base layer, some sort of fleece/powerstretch mid-layer(s) and a hard-shell top. Bottoms were usually a woollen base layer with hard-shell or soft-shell pants. At night we put on another mid layer plus a down jacket. Two of us had Mont Merlin jackets and two had Mont Icicles and the general consensus was the extra warmth of the Icicles was worth it (love the hood). Soft-shell gloves worked really well as they were warm irrespective of how wet they were. We also found the powerstretch beanies to be much warmer than the icebreaker ones. 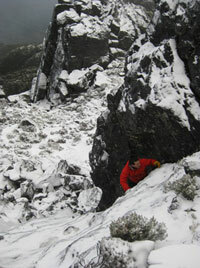 David had Rab Treklite softshell pants that were excellent in the wet conditions. Breakfast was approximately 100g of muesli per person while lunch was 2 packets of flatbread plus 300g of cheese and 2 packets of tuna for the four of us. Dinner was usually two Chefsway double serve meals beefed up with an extra 500g of carbohydrates (i.e. pasta or cous cous). Packet soups and chocolate also supplemented this, but we found this amount to be generous for 4 very hungry people. 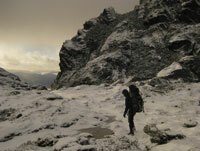 We each had a pair of 12 point walking crampons, which proved very useful. They added quite a bit of security on steep and icy rock. 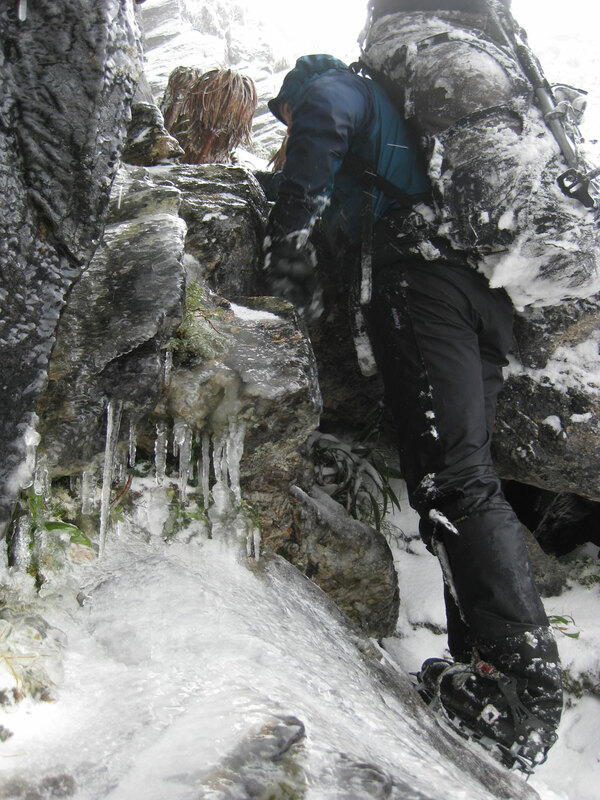 Instep crampons would possibly also be suitable. We took two walking ice axes, however these could probably be left behind as the snow was never hard enough to give them any purchase. Walking poles proved critical for river crossings – both for testing the depth and providing stability in strong currents. 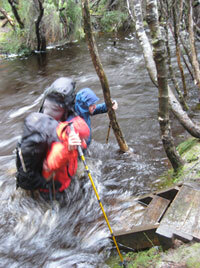 We also had a 30-metre rope, which was very useful both for pack hauling and as an aid to river crossings. It was 7mm and the bigger diameter gives a much better grip with gloves on. Maps: The range is covered by three of the 1:25,000 Tasmap sheets. Razorback, Glovers & Crossing. 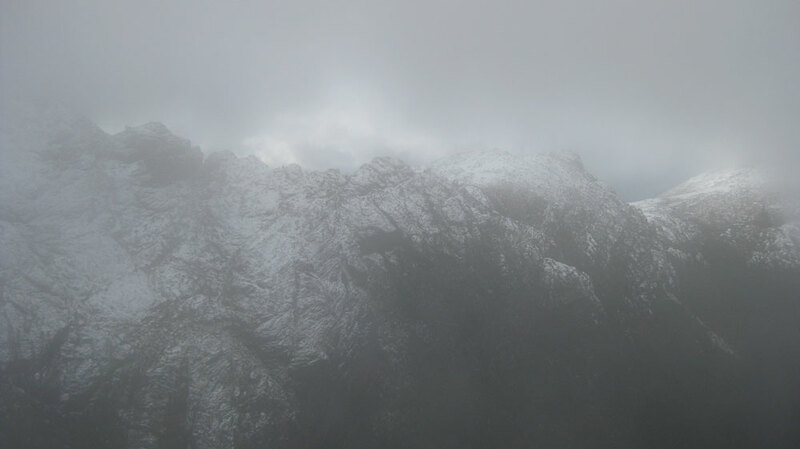 The very start of the track from Scotts Peak is on Scotts but the route here is clear and the map not really necessary.